Ithaca can sometimes feel far removed from the rest of the world—sheltered, in a way, from larger conflicts and problems. But this does not have to be the case. For Forrest Hill, Ithaca was home, and Cornell was his beloved institution. But that did not stop him from trying to alleviate suffering in other parts of the state, the country, and the world. Called “Frosty” by his friends, Hill’s career belied his chilly nickname. He had a lasting impact on the Cornell community, first as a professor of agricultural economics, and later as an administrator. He served as provost of the University from 1952 to 1955, when he left Ithaca to head the overseas development program at the Ford Foundation. This wasn’t the first time that duty had called Hill away from campus. 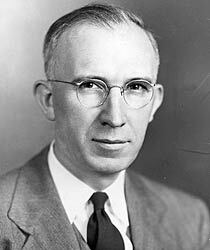 During the Great Depression, he was appointed deputy governor, then governor, of the newly reorganized Farm Credit Administration. Under Hill’s leadership, the organization became a resource for farmers who needed financial assistance during one of the country’s worst economic and agricultural crises. Hill’s tenure there was informed not only by his academic background, but also by his own upbringing on a wheat farm in Saskatchewan. The plight of the farmer was one that he understood intimately. This social conscience informed his academic work when he returned to Cornell in 1940. His research involved studies of New York State, with attempts to determine the areas where farming would be most and least profitable for small-scale farmers. Using this data, farming activity could be better organized in order to yield maximum profits for those who worked the land. His work at the Ford Foundation similarly focused on improving the outputs of farms, increasing profits for farmers and the nutrition levels of larger populations. Recognizing the importance of rice as a global crop, he proposed a partnership between the Ford Foundation and the Rockefeller Foundation to develop the International Rice Research Institute in the Philippines, dedicated to studying ways to improve rice productivity. The Philippines outpost of the Institute was so successful in developing high-yield rice varieties that two more facilities were founded in Africa and South America. Hill served on the board of directors of all three for many years. Furthermore, he demonstrated his true gift for management when he recognized the need for continued funding of the institutes. The group of philanthropists he assembled at the Rockefeller Conference Center in Italy provided support to the project long after he retired. Though his work had taken him all over the country and the world, Hill thought of Cornell as home. After serving as a consultant to the Ford Foundation for an additional decade after his official retirement, he returned to Ithaca.